LaMichael James at the Rose Bowl. We are building something special as a resource for Oregon Football fans everywhere, but need help with time-consuming work to help make it happen. I have put over 100 hours into this project, and thus why the Oregon Football Repository is up and available here, but I need help from you! We had a big tech problem on the site a few years ago, and thus why we did not have an index or a way to find articles–but I’ve changed that in order to help Duck fans tap into the wonderful collection of articles created over the life of this site and other Oregon sites. We need help as now we have over 1,000+ articles and videos, but there is more to add to the incredible 12 sections of the Oregon Football Repository, as we wish to make it a valuable resource for all Oregon fans. I wish I could tell you it is glamorous work, but it is not. It is repetitive and boring, but must be done to create something special as we are copying-and-pasting links and titles of a few hundred selected videos about our beloved Ducks. I have been working away at it, but with another hundred+ hours of work ahead of me–it will take forever (with my new schedule) to complete it. What is in it for me? Well–not much other than paying the bills of the site and the satisfaction of helping the writers and analysts have their work read by thousands of fans over the years. I gave up trying to monetize the site, and now just want to help readers and fans like before. There is no other website like this for educating the football fan; help us to help the fans as we are a non-profit all-volunteer site. 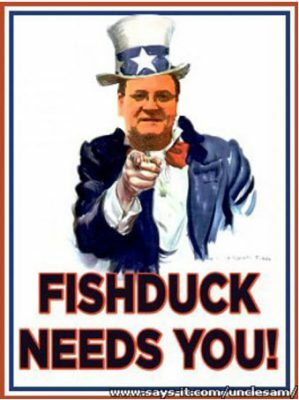 How to Apply: Email Charles Fischer at charles@fishduck.com or call 541-915-4541. For the Retired? The majority of our writers are passionate Oregon fans who have full time jobs, families and other interests, (Some are even retired) yet weave in some time to their beloved Ducks through this site every week. You are welcome to join us! We have been interviewed and cited/quoted as a source by the Wall Street Journal, and twice have been featured in prominent articles in the Online Sports Section of The Washington Post for our contributions to fans and coaches wanting to learn about the Oregon Spread Offense. FishDuck.com has even been accredited by Google News as an official Oregon Sports news source. Our football instructional videos have been viewed more than a Million times and we are UO Media Credentialed, sitting on Press Row in the Autzen Press Box and Matthew Knight Arena in Eugene.